At first this ensemble can feel a little like two suits in one, but as you look a little closer you can see how Kit has showcased his personal style through the use of a cream waistcoat, tails, and pinstripe trousers. Just because a suit often has the same colour and style for jacket and trousers, doesn’t mean you have to match the two! I love how the use of the grey trousers work so well with the black jacket. It is definitely not for the faint-hearted, as it truly is a fashion statement, so if you are one to be confident with your style, I’d suggest taking this as inspiration for your upcoming wedding. It will also look excellent as the day turns into night, and the jacket can come off, as the black tie goes perfectly with the black stripes in the pinstripe trousers, and cream waistcoat! Harry Potter star, Matthew Lewis, married his long-term partner Angela Jones, with an outdoor ceremony in Italy, whilst wearing a traditional black suit and bow tie. This is the perfect option for grooms looking for a simple and elegant look, as it can suit all body types. 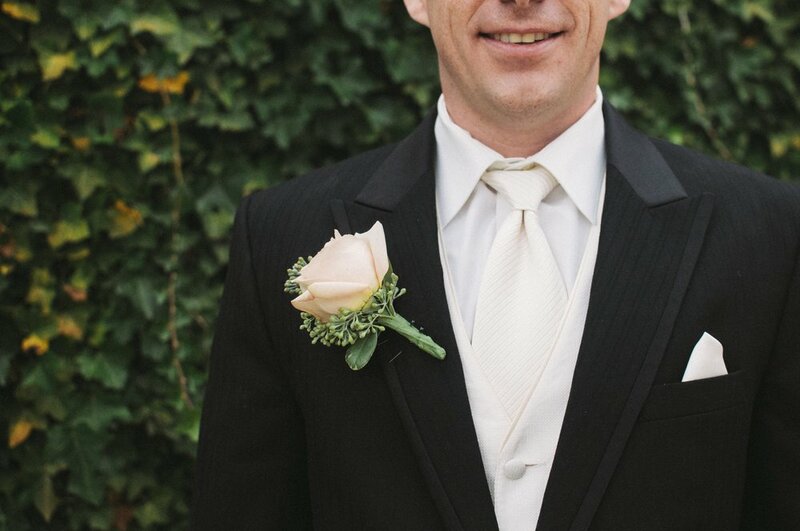 Where you can add a little flair is with your bow tie or tie, as well as with your boutonniere that can tie-in to the colour scheme of the wedding. I suggest, for grooms who are tall and lean, to opt for a slim fit suit, whereas grooms who have slightly thicker legs, should try a more traditional fit, as these styles will work more to your body type. You will also notice that he matched his watch to his silver ring, to tie in the style together as one, which I thought was a simple and elegant touch! Fedez is known for having a unique style and truly showcased that with his Versace wedding suit, by going against the norm of wearing a tie and choosing a high neck shirt with a pearl top button. It was an elegant look, with gold accents throughout the ensemble, including his gold watch and cufflinks. I love the use of gold against the black which is a classic colour combination. His tattoos were just viewable when he moved, whilst maintaining a smart overall feel. This look is perfect for grooms who are looking to have a more toned-down style, without having to follow a traditional tie and waistcoat outfit. Something to take from this style is that you don’t have to follow traditional rules for your wedding outfit, you can truly stand out by picking an outfit that you feel comfortable, smart, and yourself in, that is the most important part of dressing for your big day. I featured Megan Markle’s wedding dress and reception dress in a previous blog, and I wanted to share Prince Harry’s reception tuxedo as it felt like an excellent example of a way to change your style through the day. 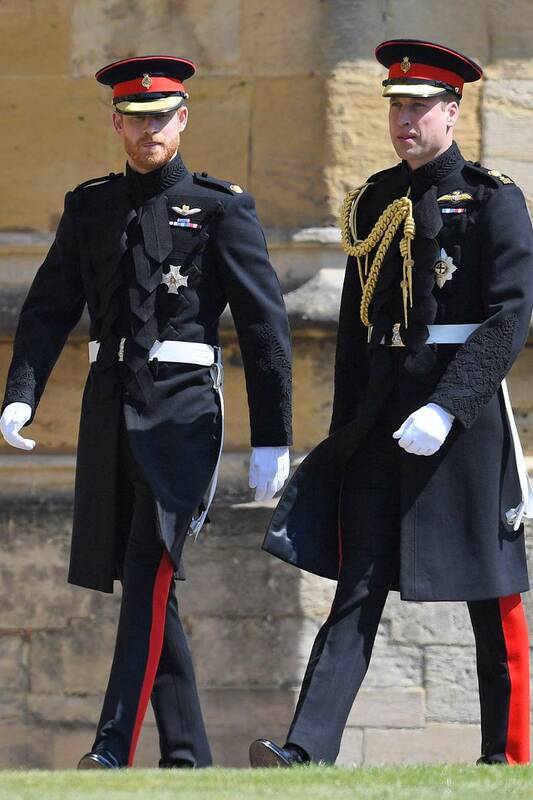 Harry started the day wearing his traditional military attire, and then dressed down into a tuxedo and bowtie for the reception. It isn’t just brides who can take the idea of changing throughout the day, and a suit can be changed up completely, or have simple edits made to create a whole new look – such as changing your tie, or adding a waistcoat for the reception. You can let loose a little when it comes to your reception, so don’t think you have to stay stuck in the same suit all day! Although it isn’t a groom, I had to share David Beckham’s suit which he wore to the royal wedding last year, as it got so much exposure and showcased a hark back to traditional styling for suits, which is so beautiful! He showed up in style, being the first man to show-off designs by Kim Jones for Dior Homme, and set it off with a traditional pocket watch. The suit was wool twill in charcoal grey, with a light grey twill double-breasted waist-coat. You can’t see as well in the image, but the use of the dark grey, offset with a grey silk satin tie and light grey waistcoat looks perfect for the attire expected at such an event. This is a perfect look for grooms (or guests) looking for a much more formal look, and the wool twill is a great choice for a spring-time English wedding. I hope you can see that, even though suits may feel like a pretty simple choice for a wedding, you have a host of options to help you showcase your style on your wedding day. If you are unsure on how to showcase your style, whilst still feeling comfortable for your big day, I’d love to help I can help you find the perfect piece to wear for your wedding, and even find the right accessories to truly make the outfit stand out.